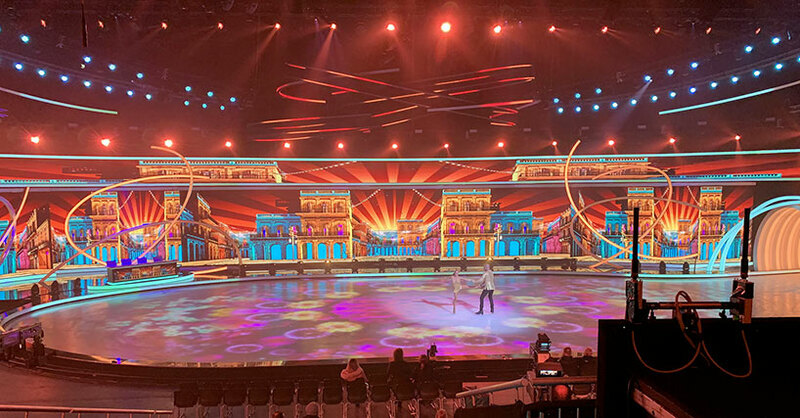 Eight of ArKaos’ new 4K Studio Servers were in action providing a 360-degree video solution for the recent fourth German edition of popular TV franchise Dancing on Ice, which was recorded at the Magic Media Company’s Coloneum venue in Ossendorf, Cologne, a special set up customised for the first series. They needed this for quick and precise video mapping for the large-scale LED screen covering 360 square metres and wrapping the studio which was integral to the production design … as well as hardware with genlock capabilities. The LED screen was three different pitches – 2.8, 5.7 and 8.6 pitch and the two main rings of LED around the studio were 6768 and 8568 x 144 pixels resolution respectively. In addition to this, four LED banners ranged between 1768 and 4160 by 728 pixels and there was a strip of LED in front of the judge’s chairs. Furthermore, Manuel and Dennis wanted a manufacturing company that had an imaginative approach and whom they could trust in terms of support and ongoing development as well as a team with whom they could build a solid relationship for the development of potential future needs. Olli and Dennis met Manuel Da Costa at the latter’s MDC company HQ where they discussed the overall production design that Manuel had in mind and how the ArKaos system would help facilitate the specific aesthetics. After this, ETC Germany placed the order for the eight servers - plus a spare - so Dennis and Manuel could have the powerful, flexible and dynamic video control they required. “For me, the ArKaos server is a fast plug-and-play solution that stands out from other media servers in terms of flexibility and speed. I am very interested in how this server will be developed even further."